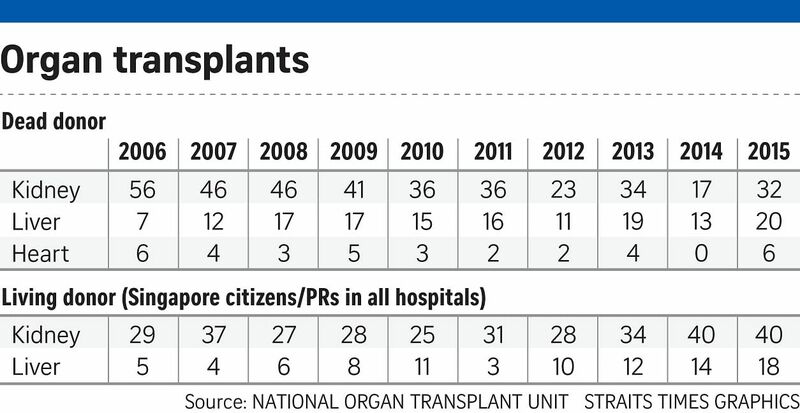 In 2004 and 2008, the Human Organ Transplant Act was extended to include as donors, people who die from non-accidental causes and Muslims respectively. The list of organs was also expanded beyond kidneys to include livers, hearts and corneas. In 2009, the age cap of 60 for dead donors was lifted. In 2011, the law was amended to allow living organ donors to be reimbursed for medical expenses and loss of income. The Ministry of Health (MOH) said it has, with charities such as the National Kidney Foundation (NKF), regularly engaged with the public and organ failure patients and families to increase awareness of organ donation. This year, it will again embark on an awareness campaign. Likewise, the NKF has started a campaign this year, featuring radio interviews with its patients and donors to dispel fears about kidney transplants. Almost every other day, NKF staff go to schools, offices and community and religious organisations to conduct educational roadshows on live kidney donation. These campaigns are important because would-be donors often have concerns about their health should they go ahead with the donation, said the NKF. People can live on easily with one kidney, and the risk to the donor is low, it added. In response to cost concerns, the NKF launched a scheme in 2009 to provide financial aid for needy live donors to assure them that many post-transplant charges will be taken care of. It also enhanced its insurance coverage for donors in 2013.